FeaturedCustomers awards NextGen Healthcare highest overall customer success score. Today FeaturedCustomers released the 2019 Spring Medical Practice Management Software Customer Success Report to give prospects better insight on which Medical Practice Management Software would work best for their business according to real customer references. 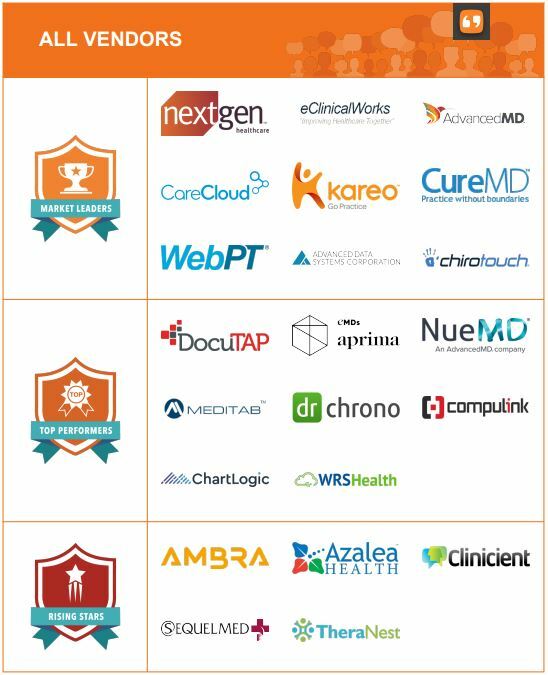 Market Leaders – NextGen Healthcare, eClinicalWorks, AdvancedMD, CareCloud, Kareo, CureMD, WebPT, Advanced Data Systems, and Chirotouch were given the highest “Market Leader” award. Market Leaders are vendors with a substantial customer base & market share. Market Leaders have the highest ratio of customer reference content, content quality score, and social media presence relative to company size. Top Performers – DocuTap, Aprima, NueMD, Meditab Software, DrChrono, Compulink, Chartlogic, and WRS Health were awarded “Top Performer” honors. Top Performers are vendors with significant market presence and enough customer reference content to validate their vision. Top Performers products are highly rated by its customers but have not achieved the customer base and scale of a Market Leader relative to company size. Rising Stars – Ambra Health, Azalea Health, Clinicient, SequelMed, and TheraNest were awarded the “Rising Star” honor. Rising Stars are vendors that do not have the market presence of Market Leaders or Top Performers, but understand where the market is going and has disruptive technology. Rising Stars have been around long enough to establish momentum and a minimum amount of customer reference content along with a growing social presence. The customer success report is based on over 1800 pieces of verified customer reference content. A vendor’s overall customer success score is reached via a weighted average of their Customer, Social, and Company Scores. Of the 38 vendors listed in the FeaturedCustomer’s Medical Practice Management category, 22 vendors met the minimum requirements needed to be considered for the customer success report. FeaturedCustomers, the world’s only customer reference platform for B2B business software & services, helps potential B2B buyers research and discover business software & services through vendor validated customer reference content such as customer testimonials, success stories, case studies, and customer videos. Every day our platform helps influence the purchasing decisions of thousands of B2B buyers in the final stages of their buying cycle from Fortune 500 companies to SMB’s.